Okay, I've heard it all now. A Minnesota man is in trouble with the law... for crashing his recliner while driving drunk. That's right, I said 'recliner.' He was driving a recliner equipped with a motor, cupholder, and stereo. Sounds nicer than my car. Here's the news report. I'm wondering how they kept a straight face. Here's the story from 'Action 13 News'. I'm ripping off the Spokesman's 'Huckleberries' blog right and left this week. 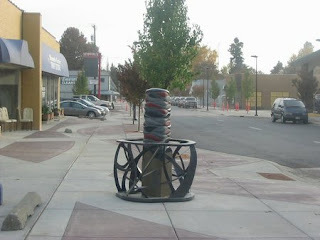 Yesterday I posted their picture of one of the new bike racks in Coeur d'Alene's midtown area. Well here are pictures of the other two new racks. 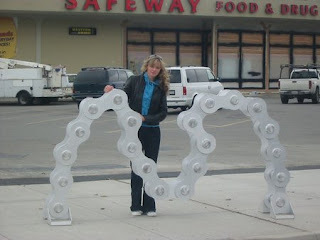 The woman in the one by the rack that looks like a chain is the artist herself, by the way. All the bigwigs were out for yesterday's ribbon cutting ceremony to mark the completion of Coeur d'Alene's Midtown Improvement project. Here's Mayor Bloem doing the deed, and which KMPO Board member is that in on all the action? Al Hassell of course. Here's an article on the ceremony and what it took to get Midtown looking this spiffy. So what do you haul on your bike? Books? Your laptop? Maybe a child if you have a baby seat? Well, I stole this off John Speare's 'Cycling Spokane' blog as a sample of something different you can haul- pets! Well, people with normal pets anyway. If I tried this with my cat Bob, he'd chew his way out of that plastic carrier, kill me, then drag the bike off to a pawn shop sell in order to buy some catnip from Canada. 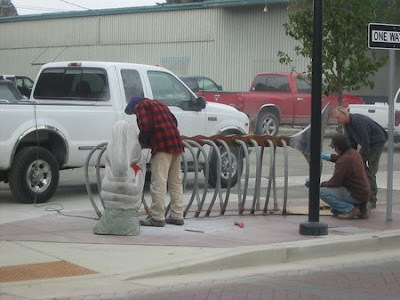 So here's a look (stolen off the Spokesman's 'Huckleberries' blog I might add) at one of the bike racks being installed as part of the 4th Street Renovation Project in Coeur d'Alene this week. Rumor has it that all the racks are 'artsy' like this fish-inspired one. I see a field trip in my future to check them all out and take more pictures. Here's an update for you: work on the Regional Non-Motorized Plan is wrapping up. We're proofing our draft right now and adding some pictures and other small items to make it pretty, then it will go out to the public and to the Kootenai County Area Transportation Team (KCATT) and the KMPO Board in November for review and comment. Check back 'cause I'll post a link to it here. I blogged earlier this week about how it's Teen Driver Safety Week. Well, today I found this website by the 'Century Council' (according to them they're distillers drunk driving and underage drinking) devoted to making underage driving safer. Among other things on the site, they have the 'Concentration Game' below you can try. Let's just say I didn't do so good. Here's early notice of some public meetings that Citylink will host next month to give the public a chance to comment on local bus service. The Coeur d'Alene Tribe, which operates Citylink, is evaluating bus routes, bus stops, bus accessibility and any other information pertinent to the transit system and wants to hear from you how they're doing. The Midtown Improvement and Place-Making Project will hold its ribbon-cutting ceremony this Thursday, October 22nd, at 11:00 a.m. and everyone is invited! Please join Mayor Bloem, Council Members, and representatives of 4th Street businesses at the intersection of 4th Street and Montana Avenue to celebrate this event. The three-phase project – a major revitalization effort – included enhancement of the midtown area. The first phase began at Foster Avenue and ended at Miller Avenue. The second phase started in late June and began at the alley north of Lakeside Avenue and proceeded north to Foster Avenue. The final phase started in late July and began from Miller Avenue north to Harrison Avenue. Always on or ahead of schedule, the project, supported by the City of Coeur d’Alene, the Lake City Development Corporation (LCDC), and Local Improvement District (LID) funds, is an eclectic blend of specialty shops, restaurants and residences, paved intersections and public art, pedestrian-friendly sidewalks, and tree-lined streets. By the way, one of the discussions going on over at the Spokesman's 'Huckleberries' blog is what bloggers like most about the 4th Street project. So far answers have ranged from the new bus shelters to the street trees and wider sidewalks. Take a look and voice your own opinion. Don't rake your leaves into the street just yet. 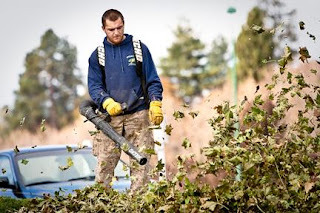 The Coeur d'Alene Street Department is experiencing some delays in starting the annual fall leaf pickup. Next week is Teen Driver Safety Week in Idaho, meaning law enforcement and other agencies will be taking a close look at the behavior of teenagers behind the wheel. The article below came from the Idaho Falls Post Register, but I would've had to pay to link to it, so I just cut and pasted it. IDAHO FALLS - Teen drivers will be the focus of next week's statewide "Youthful Driver School Zone Campaign." Idaho Falls police officers will be doing extra school zones patrols Monday through Friday to encourage drivers to obey speed limits and ensure all passengers are wearing seat belts, Sgt. Dave Frei said. Bonneville County deputies will also be patrolling school zones, Sgt. Doug Metcalf said. The campaign will be held in conjunction with National Teen Driver Safety Week, which looks at teen drivers and the risks involved with passengers in the vehicle. "Statistics show a teen driver with one passenger doubles the risk of a fatal crash," Frei said. "A teen carrying three or more passengers quadruples the risk." According to Idaho Transportation Department data, drivers age 15 through 19 were involved in 296 fatal or serious injury crashes statewide in 2008. There was one 2008 highway fatality involving a teenager in Bonneville County. There were four in 2007. The goal is to educate teens about safe driving and, as a consequence, to reduce accidents, Frei said. Officers will also be on the lookout for traffic violations committed by adult drivers. An Office of Highway Safety grant will pay for the overtime of 33 Idaho Falls police officers. The agenda hasn't been finalized yet so check back here in a couple days to see if I've posted it yet. The purpose of the Roundtable is to promote continued coordinated planning and development of integrated public transportation services within and through Kootenai County. The Roundtable meets quarterly. The first report on Idaho’s federal stimulus money spending is out, and it shows that the money spent so far, $12.8 million, has created or preserved almost 500 jobs. Here's more from the Spokesman-Review's 'Eye on Boise' blog. That's right folks, it's the first car to use a urine-like solution to reduce tailpipe emmissions. So what, exactly, is a 'urine-like solution?' According to the article, it's a special man-made liquid similar to human urine to reduce emissions of oxides of nitrogen (NOx). The compound, called AdBlue, is a mixture of roughly one-third pure urea and two-thirds demineralised water. 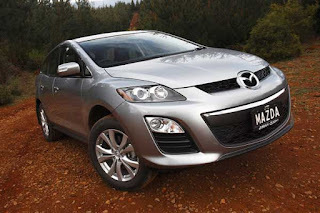 Before I get in trouble here for posting anything questionable (more questionable than the above anyway), I'm going to say, just read the article and tell me if you'd buy this car. Apparently Google is considering creating maps of the best bicycling routes in any particular area, because the idea has been posted on their 'Suggest It' page where the merits of possible new developments are weighed by the public. If this seems like a good idea to you, go to the Google site and “vote” by clicking the 'Suggest It' button. The bike route mapping is under the heading 'Route Information.' If Google is flooded with requests, the proposed feature could become reality. Another chapter in the saga of the Sand Creek Byway; The Environmental Protection Agency is fining the Idaho Transportation Department and Parsons RCI $65,000 for Clean Water Act violations. Here's why, from the Idaho Statesman. Transportation Secretary Ray LaHood has multiple battles he's fighting; not only is he the sole Republican in President Obama's cabinet, he's also championing livable communities- places that offer ample housing and transportation options considerate of residents of all ages and the environment— despite the movement being unpopular with some of his fellow Republicans. A big part of the concept of livable communities is alternative transportation,which LaHood fears may get swept under the rug in the upcoming federal transportation bill reauthorization. LaHood recently sat down with AARP for this interview about living in a post-car world. The record cold temperatures have Idaho drivers thinking about winterizing their cars. In fact, many are already putting on studded snow tires!Here's the story from KLEW TV. I won for that last item, by the way. What's the weirdest thing you've found beside the road? A little nervous about driving in the snow this winter? Maybe you should brush up your driving skills. The Idaho State Police will hold free road-safety classes later this month. Here's the details from the Spokesman's 'Getting There' column. Ever Been Yelled At Or Harrassed While Walking Or Biking? Over on the Spokesman-Review's 'Huckleberries' blog they're having a conversation about bicyclists and pedestrians being yelled at or harassed by drivers. Take a look and either let them know, or us here, if that's every happened to you. I've had the usual 'Hey baby!' and 'Want a ride?' yelled at me, but the funniest story I've heard was from an ex-boyfriend who was pretty skinny and had beautiful long red hair in his younger years. He said he was walking down the street when a pickup full of men approached him from the back and slowed down, yelling things like 'Hey baby, want to come home with us?' and other, much more lewd, suggestions. When he turned around and they realized he was a guy, they freaked called him names and threatened to beat him up. Like it was his fault they were being sleazy or something. Despite a $54 million transportation funding compromise that ended Idaho’s second-longest legislative session earlier this year, Idaho's transportation fund is shrinking. In fact, it now stands at about $28 million – far less than what officials say is needed to keep Idaho’s roads up to par. Here's the article from the Spokesman's 'Eye on Boise' blog. Nearly 33,000 cyclists embarked on the Route of the Hiawatha this past season, a 14% increase from last year’s total of roughly 28,700. And the trail had visitors from all over, including Norway, Luxembor, and Samoa. Here's an article from the Shoshone News Press on the trails' busy season. The Idaho Transportation Department has announced that communities may begin applying for 2012 funds to encourage students to safely walk and bicycle to school through the Safe Routes to School (SR2S) program. Successful SR2S programs increase the number of students walking and biking to school, help to improvem children's health, and cut down on vehicle emissions. For more information on what kind of projects are eligible and how to apply, click here. The Coeur d'Alene Press is speaking out today with an editorial about the dog that Kootenai County Deputies shot a couple weeks ago. The dog was running around on I90 near Post Falls and deputies and other drivers were not able to catch it. The story was so upsetting to some people that it went national, and the Press received letters from as far away as Florida regarding the incident. After much public outcry, the public sentiment seems to be to villify the deputy who did the shooting. The Press editorial disagrees though. The cost of flying keeps creeping up- and it may do so even more if you try to fly around the holidays. Several big airlines, including airlines that fly into and out of Spokane International Airport, have added $10 surcharges for busy days around the holidays. Last month airlines added a $10 each-way surcharge for Nov. 29 (the Sunday after Thanksgiving) and Jan. 2 and 3. Now, the website FareCompare.com, says airlines will also charge more to fly on Nov. 30; Dec. 19, 26, and 27; March 14, 20, 21, 28; April 11; and May 28. The surcharges were added by Delta, Northwest, American Airlines, United Airlines, Continental Airlines and US Airways. The new rage with planners is to install 'bulbouts' that shelter pedestrians from oncoming cars and slow traffic somewhat. But while bulbouts are good for walkers, one Montana woman says they're not so safe for bicyclists; and she has three broken teeth and 30 stitches to prove it. Here's more information on bulbouts, and this woman's story. An analysis of stimulus money says that well over $200 million has been directed to Eastern Washington and North Idaho counties. But one of the biggest criticism of the program is that it's difficult to determine how much money's been spent and how. Here's an overview the stimulus program in our area. September was another very good month for Citylink. Numbers just released show ridership was down a little from last month but up a decent amount from the same time period last year. Here's a look at the latest numbers. The City of Coeur d’Alene Street Department has closed off the pedestrian entrance to City Hall from the library parking lot until this Thursday. City Hall patrons will be diverted to alternate entrances until four large panels of concrete are replaced in that area. 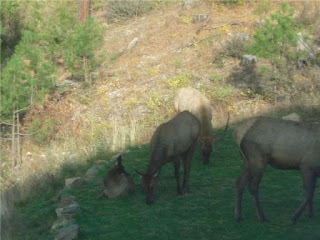 Here's what I saw while driving this weekend: one herd of elk, dozens of turkeys, more deer than I can shake a stick at, and six coyotes. I know I've said it before, but it's that time of year again, so take it easy on roads in outlying areas. The animals are coming out of the woodwork so be careful. The number of roadkills I've seen lately is crazy. 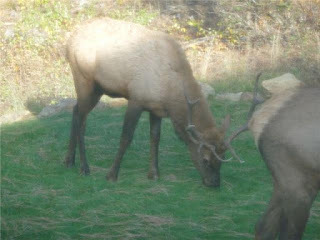 These pictures were taken out the bedroom window of a friend who lives near Hauser, by the way. Still angry about Kootenai County Sheriff's deputies shooting a small dog on the freeway last week? So are dozens of other people who say they could have handled the incident better, while ensuring public safety. 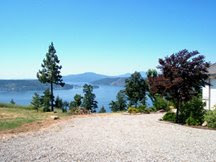 Check out the 'Letters' page of the Coeur d'Alene Press' website. Yep- almost all angry letters about the incident. There's been a lot of outcry regarding a small dog that was euthanized last Friday near I90 in Post Falls because it was distracting drivers and obstructing freeway traffic. Today, the Kootenai County Sheriff's Department said it had no choice but to shoot the dog, in order to ensure the welfare of the public. 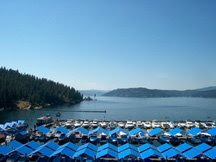 Here's the rest of the story from the Coeur d'Alene Press. No one wants little animals to be shot, but in this case do you think the action of the police was warranted to avoid traffic accidents and possible injury to humans? A joint legislative committee has decided to hold off for another year on shifting gas tax funds away from the state parks department and the Idaho State Police- and Gov. Butch Otter is raising no objections. This is significant because the fund-shifting was key to a session-ending deal between Otter and lawmakers that allowed the legislative session to end... after 117 days. Here's more from the Spokesman's 'Eye on Boise' blog.